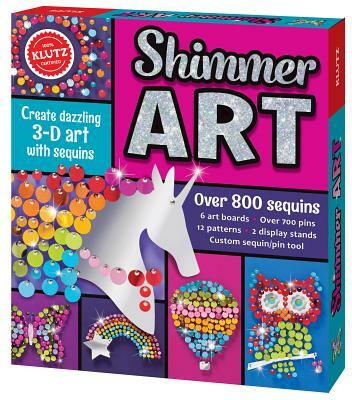 Craft 3-D art that shimmers and sways Shimmer Art brings sparkle and shine to our cardboard-and-pins String Art system. Choose from 12 dazzling designs including a unicorn, hot air balloon, sea horse, peacock, and more. Then use our only-from-Klutz double-tipped tool to easily push pins and sort sequins into the color scheme of your dreams. Once you've got the perfect combo, display your eye-catching creations to bring a little bling to your space.